Info "This supersecure safe has two dials on it. Open it using the Form Baton and the Balance Stone." Not to be confused with Safecracker. 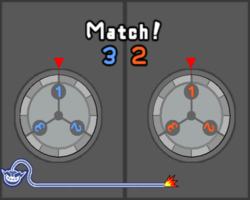 Safe Cracker is one of Orbulon's Microgames in WarioWare: Smooth Moves. The player must twist the dials accordingly on-screen. The Nunchuck controls the left dial, while the Wii Remote controls the right. 1st level difficulty: Three possible choices. 2nd level difficulty: Four possible choices. 3rd level difficulty: Five possible choices. This page was last edited on February 20, 2018, at 18:13.